Turi Kumwe ~ We are Together! Hospice without borders is pleased to announce that our colleagues from Rwanda will be traveling to Kampala later this month to work with Hospice Africa Uganda (HAU), and further expand their expertise in the production and distribution of oral morphine solution for palliative care and hospice patients in Rwanda living with moderate to severe pain. 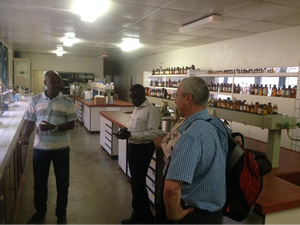 Vedaste Habyalimana, lead Quality Control Pharmacist for the republic of Rwanda, is shown here at left touring Jean Claude Tayari and David Slack through the testing unit at the Labophar production facility. Most important to their upcoming trip, Vedaste and Richard Gatera, the chief production pharmacist at Labophar, will be making visits to the homes of hospice patients. In those homes, on the ground, they will see firsthand the power of oral morphine to improve the quality of life for those people suffering with incurable illness and crippling pain. At HWB, we are grateful for the opportunity to work in solidarity with leaders such as Vedaste and Richard, who are committed to improving access to opioid analgesics for all the people in Rwanda living with incurable illness and severe pain. Turi Kumwe! wonderful post, very informative. I wonder why the opposite experts of this sector do not understand this.You should continue your writing. I’m sure, you’ve a great readers’ base already! marginalized poor in Africa and here in the USA.